Crochet Work-in-Progress, that is. It's a shawl, and comes from a Coats and Clark pattern. 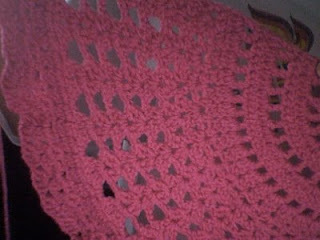 It's called Be a Friend shawl. I'm even using the same yarn the pattern calls for, Light Raspberry. Your shawl is looking lovely so far. How big will it be when it's done?